Compare prices on car hire in Bergen from all the major brands and find the best deals. When you book through us, unlimited mileage and insurance are always included in the price given. Bergen, which has approx. 257,000 inhabitants (2009) is the second largest city after Oslo , and administrative center in the western Norwegian county of Hordaland.It was founded in 1070 (Bjorgvin) at the foot of the seven mountains – and sea borders to the Norwegian Sea / North Sea. Until 1314, Bergen was Norway’s capital – and in the period 1300 to ca. 1750 was the most important cities of the German Hanseatic League. Bergen has a number of attractions to offer. Some of the most important is St. Mary’s Church from the middle of the 1100s (the oldest preserved building) and Cathedral (also from the 1100s, but later restored and rebuilt after several fires). Other important medieval buildings are the oldest parts of Bergen Castle, where we find Earl Hall (1200’s) and Rosenkrantz Tower (1200-tallet/1500-tallet). Bergen’s most famous attraction is Bryggen – a unified buildings from the Hanseatic period, which is a UNESCO World Heritage Site. Also Troldhaugen, composer Edvard Grieg’s beautiful and distinctive homes in the borough Fana is a popular destination. Here you will also find a separate Grieg Museum. And the fish market in the center – the city’s oldest trading place – it is very crowded, especially during the summer. Bergen is Norway’s most important cultural cities – and some of the core institutions Theatre The National Theatre and Concert Hall The Grieg Hall. And every year in May and June there the internationally renowned festival. Mention must also Bergen Museum, Bergen Art Museum and the Bergen Maritime Museum. Besides the spectacular Aquarium Attraction most should see. A trip to Scandinavia’s oldest rail cableway to the top of the 350 m high mountain Fløien is not to be despised – or you can take the gondola to the top of Bergen’s seven mountains, Ulriken (643 m). Bergen Airport – Flesland located approx. 20 km south of downtown. Car-hire.net offers a good selection of cheap car hire in Bergen and in Bergen Flesland Airport. 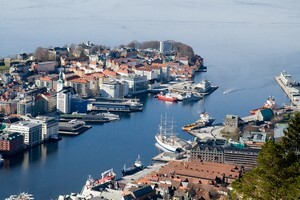 Select the desired destination in Bergen and get an instant list of available rental cars.